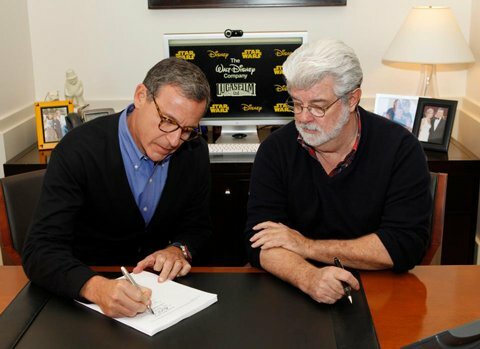 UPDATE: The official press release announcing the acquisition, as well as photo of George Lucas and Disney CEOBob Iger signing the official deal, have been added to the bottom of this post. The Walt Disney Company has been working hard to develop strong science-fiction properties over the last few years. But while they've found big success in the acquisition of Marvel Studios - with The Avengers becoming the third biggest release of all time - they've slipped in other areas. In 2010 the studio released Tron Legacy, which ended up making quite a bit of money, but wasn't quite the blockbuster success that everyone expected it to be. Then there was John Carter earlier this year, which was an even bigger disappointment, managing to make only $73 million domestically on a $250 million budget. Now, though, they no longer need to worry about developing sci-fi franchises however - because they've just bought Star Wars. A truly stunning development, The Walt Disney Company has purchased Lucasfilm for an amazing $4.05 billion in both cash and stock - but that's not even the most stunning part. According to the trade report, they will now begin serious development on Star Wars Episode VII - presumably a direct sequel to Return of the Jedi - and plan to have it in theaters by 2015. Legendary producer Kathleen Kennedy who is currently the co-chair of Lucasfilm, will be promoted to become the new president of the company and will report directly to Alan Horn, the current Walt Disney Studios head. This is definitely a lot to take in. The prequels were an absolute disaster, but could they ever be redeemed? How insane is it that we could be seeing The Avengers 2, Justice League and Star Wars Episode VII in theaters in three years? This is obviously a big story and will generate a lot of discussion. Are you happy that the Star Wars franchise will continue? While we wait for more details, here's the photo included with the official announcement-- the beginning of a new era.